One of the must do things on Hatteras Island is a trip to the Graveyard of the Atlantic Museum which holds some of America’s most important maritime history. 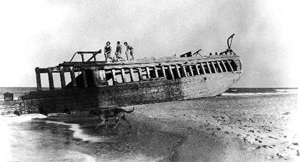 The museum preserves Outer Banks maritime history and shipwrecks from the earliest periods of exploration and colonization to the present day. The Graveyard of the Atlantic Museum is a public, non-profit, educational institution and it is part of the North Carolina Maritime Museum System within the State History Museums, Division of Archives and History, Department of Cultural Resources. The museum preserves, researches, exhibits and interprets its collections for the benefit of the general public and specialized audiences. For more information on what you might find and learn at the museum visit www.graveyardoftheatlantic.com.